It’s a question that many parents hear from their youngsters. Unfortunately, the decision process can be difficult to navigate if the child in question suffers from allergies related to dogs, cats, bunnies and birds. Parents shouldn’t feel overwhelmed by this situation, as the following brief review of current research may help those seeking a solution that makes everybody happy. Millions of Americans suffer from fur or feather allergies. These people have immune systems that overreact to the harmless proteins (called allergens) in pet dander, which comes from dead skin cells, saliva or urine. Pet hair is not the primary problem, but does collect dander. When normal shedding occurs, the allergens can spread and persist in the environment. Recent estimates put the total U.S. pet population at more than 100 million companion animals, about four pets for every ten people. With nearly six out of ten people experiencing at least occasional contact with companion animals, chances are that someone you know suffers from pet-related allergies. For the 10% of children who are deemed highly allergic, doctors almost uniformly advocate avoidance. These are children who have a dramatic reaction with even intermittent exposure. Your first stop – especially before searching for adoptable animals – should be a visit with your pediatrician to inform your decision-making process. 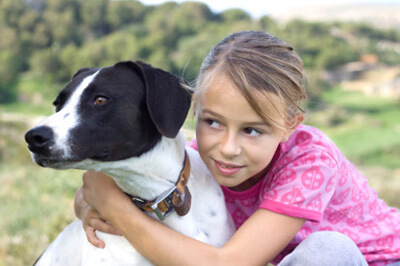 Your child may need to undergo some basic testing, but armed with the results you’ll be better able to determine whether a pet should be added to the family. For children with only minor symptoms, I think the benefits of having a companion animal usually outweigh the annoyances for many families. In fact, several studies have demonstrated that childhood allergies actually become less severe the longer kids live with a family pet. Other studies have shown that children who care for dogs during their early years later become more empathetic and less likely to have behavior problems. If your child has pet-dander allergies, there are steps you can take to minimize the presence of allergens in your home. Weekly bathing can significantly reduce the amount of dander in the home environment. Regular, thorough house cleaning - especially of soft surfaces like carpets and furniture - and designating the child’s room as a pet-free zone can make a huge difference. Also helpful is the use an air purifier in your child’s bedroom and using superior-grade HEPA filters in your central air system. I highly encourage you to have your child wash his hands after petting or playing with your companion animal, and making him mindful of keeping his hands away from his face during pet-playtime. Once you’ve committed to these lifestyle changes, it’s time for locating the perfect companion animal. If you’re planning on adopting a dog, look for breeds with soft, constantly growing hair. Canines such as Poodles, Bichons, Cockapoos and Portugese Water Dogs (like the famous First Dog Bo) may prove to be less likely to aggravate allergic responses for some individuals, although some experts claim that this may only be because they tend to be washed and groomed more often than other breeds. Contrary to popular belief, there are no true hypo-allergenic breeds of dogs and cats. In fact, even hairless breeds can provoke symptoms. A 2011 American Journal of Rhinology and Allergy study compared the level of allergens present in homes of hypo-allergenic dogs versus other breeds. The researchers examined dust samples from 173 homes with 60 different breeds of dogs, including 11 breeds considered hypoallergenic. The results showed no real difference in homes with hypoallergenic dogs and other breeds. Of course, this is just one study, and further research is still needed. The bottom line is that you’ll need to be vigilant, and commit to the measures outlined above to minimize allergens in your home for your child’s safety. My recommendation is any family or individual seeking to adopt a less-allergenic companion animal should ask a shelter, breeder or rescue organization to agree to a week-long trial run. Have the allergic individual spend time with the companion animal to gauge their effect on the allergic family member. This is a really good post. I am a parent of three children, one of whom is highly prone to allergies, and they want a dog... what child doesn't. Thank you for mentioning the breeds that are less likely to be a problem in terms of allergies. Loving the info on this site, you've done outstanding job on the articles. Wonderful site, this is too useful for me, Cheers for writing this for us this is what I want. Really good site, thank you very much for your effort to writing this. This is my first time pay a visit at here and i am actually impressed to read everthing at one place. This has to be a single of my beloved posts! And on top of that its also incredibly valuable subject for newbies. thank lots for the info! "Nostalgia isn't what it used to be." by Peter De Vries. Thank you for some other great article. Not just anyone gets that type of information in such a perfect approach of writing. I like the valuable info you provide to your articles. I’ll bookmark your blog and read again here regularly. I am fairly certain I will learn many new things right right here! Best of luck for the next post! Heya, this is a superb article. Emailing this to my pals. I stumbled by this while exploring yahoo. I'll be assured to come back. Recognition for sharing. I'm impressed, I must say. Really not often do I encounter a blog that's both educative and entertaining. I am very pleased that I stumbled throughout this site. Outstanding post. However, I was wanting to know if you could write a little more on this topic? I'd be very grateful if you could elaborate a little bit further. Appreciate it! Wow! This is one of the most useful blogs We have ever arrive across on this subject. Actually Great. I'm also an expert in this topic therefore I can understand your hard work. Thanks for another informative blog. Where else can I get this type of info written in such an ideal method? A motivating discussion is definitely worth comment. I think that you need to publish more on this subject. I wanted to write in order to thank you for these amazing points. I feel pretty grateful to have encountered your webpage and look forward to tons of more enjoyable times reading here. Thanks a lot again for everything. Excellent blog! I definitely appreciate how it's straightforward on my eyes and also the information are nicely written. I’m questioning how I could be notified anytime a brand new post has been produced. I’ve subscribed for your RSS feed which should do the trick! Have a wonderful day! I enjoy the efforts you have put within this, regards for the many wonderful posts. Thanks a lot for sharing this with all of us you really know what you're talking about! Bookmarked. I just want to mention I am beginner to blogging and absolutely liked this blog site. You surely come with fabulous articles. Thanks for sharing with us your blog. Hiya, I am really glad I've found this information. A good web site with interesting content, this is what I need. Great post. I was checking continuously this blog and I'm impressed! Extremely useful info. I have read several good stuff here. Definitely worth bookmarking for revisiting. I wonder how much effort you put to create such a wonderful informative website. I definitely liked reading everything that is written on your website. Keep the stories coming. I enjoyed it! Some genuinely nice and utilitarian info on this website. I like reading a post that makes people think. Also, thanks for allowing for me to comment!